From the moment she was born, Rose’s mother had taught her little daughter to be different from all the other skunks that lived in the woods. She bathed her in fragrant rose water, put her to bed on soft rose petals and fed her mashed rose hips sprinkled with fresh rosemary. 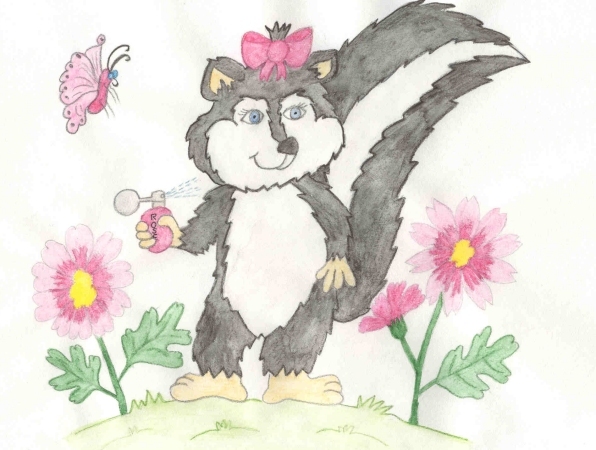 She didn’t want her to be stinky like all the other skunks, which ate things like skunk cabbage, stinkweed and stinkbugs. She wanted her little Rose to be sweet. When Rose grew up she was still very different from all the other skunks. She still bathed in rosewater, slept on a bed of pink rose petals and ate only the finest rosehips. She drank sparkling rose water from rose-colored glasses. Her furniture was made of rosewood and she had a beautiful rose garden just outside her back door. Everything she did, smelled, and tasted was like roses, even her toothpaste, shampoo and deodorant. Never would she spray, unless the spray was from a bottle labeled ‘Rose Perfume’. The other skunks were always spraying their foul odor for any old reason, so it seemed to Rose. One day, Rose went out into her garden to pick some fresh rose hips. She was just about to reach for one when she heard a loud roar. She stopped for a moment to listen, but when she didn’t hear anything else she continued picking. Another loud roar came from somewhere behind her in the distance. What was that? What was making that noise? Rose wondered what it was. Not hearing another roar for a while, she soon stopped thinking about it and picked a few more rose hips, putting them into the basket she’d taken out with her. Then she heard a noise coming from behind her and slowly turned around. There, before her, stood a big striped hyena. It let out a loud roar that blew Rose’s tail back and forth. She reached into the pocket of her rose-patterned apron and pulled out a bottle of rose-scented perfume. She aimed it at the hyena and sprayed. The hyena sniffed the air and began to laugh at Rose. He laughed and laughed. Rose got very angry and sprayed him again. He only laughed harder. After a while, the hyena stopped. He hit the bottle of perfume out of Rose’s hand and knocked the basket of rose hips over. Rose began to get scared. The hyena wasn’t laughing anymore. It was angry and growled at her. She didn’t know what to do. The hyena moved closer and closer to her. Rose grabbed her tail and sprayed the hyena. This time he didn’t laugh. He let out a loud scream and ran off into the woods. Rose could smell the foul odor all around her. She didn’t like it. She grabbed the perfume bottle and sprayed, and sprayed, and sprayed, until the whole bottle of rose perfume was gone. She gathered her basket of rose hips and went home. That night, as she lay in the bathtub, soaking in bubbly rose water, she thought about how much she still loved roses, but maybe from then on she’d eat a stinkbug or two once in a while, just in case!